Take a moment to picture the sort of frame that most people who are into bodybuilding are looking for – wide shoulders that taper off into a trim waist, and below the waist, it grows large again courtesy of the quads. The look is completed by beefy forearms and calves. Sounds good, doesn’t it? If this is the sort of shape you’re interesting in having, the following tips can help you achieve what you desire. You do want to count calories. When your goal is building mass in the right places, while keeping trim in others, calorie counting is crucial. If you eat too little you’ll begin to lose muscle, and if you eat too much you’ll grow in your waistline as well as in your shoulders. Determining the proper amount of calories to encourage development of lean muscle, and discourage excess weight where you want to stay ripped can be a bit tricky. For most men, your aim should be for between 16-20 calories per pound of body weight. To get started, go with 18 calories per pound which ends up being around 3200 calories per day for a 180lb guy, and keep an eye on how you’re progressing. If it seems that you’re not gaining as much muscle as you would like, but your abs are crazy-defined, then increase the calories to 20. Likewise, if you determine that 18 is adding too much bulk around your waist, then knock it back to 16. Get in all your necessary protein. It’s necessary because it provides amino acids, and they are the literal building blocks of muscle. The recommended daily allowance (RDA) of protein is less than half a gram per pound for a typical person. Research shows that more active individuals – athletes, those who work at strenuous jobs, for example – require double that amount, and for people who are especially interested in strength and muscle, such as bodybuilders, at least 1 gram of protein per pound, per day should be consumed. It’s okay if you get the shakes. There are two specific times during the day that whole food proteins should be avoided – 30 minutes before, and 30 minutes after working out. The logic behind this particular tip is that whole food proteins take too long to digest to be beneficial in these important periods of muscle growth, and what your body needs instead are protein sources that digest quickly. Whey protein powder is a great option. It provides the amino acids needed to prevent muscle damage, and create energy for your workout, and also facilitates muscle growth after your workout. Try having a whey protein shake with 20 grams of protein before, and another shake with 40 grams of protein, after – both within the 30 minute window of time. It’s true that carbohydrates are essential when building mass, but consuming too many is counterproductive. You’ll want to play it safe with carbs, and the best way to do that is to keep them on the low side. You want to keep insulin levels stable so that you will be burning fat all during the day as well as building lean muscle, so focus on getting less than 2 grams of carbs per pound of body weight. 1.5 grams per pound is a good number for the 180 pound guy. When you select the type of carbs you’re going to consume, go for those which are low on the glycemic index as often as possible. Whole grain products, brown rice, etc. are good choices because they digest slowly, and this is also excellent for keeping insulin levels from spiking. Within the 30 minute window we discussed above, after you’ve finished a workout, forget the slow carbs and consume fast digesting carbs which are high on the glycemic index, as this is a time when creating an insulin spike is actually a good thing. The only time that having high insulin levels will work in your favor is directly after a high-intensity workout. Any other time a spike in insulin will slow your bodies ability to burn fat. Post-workout, the insulin increases muscle growth and moves the glucose from the high GI carbs into your muscles. It’s tempting to eat a very low-fat diet when you’re trying to keep your midsection tight, but ignore the temptation. Around 30% of your total daily calories should be provided by fat, and unlike the recommendations made for the more sedentary members of the population, about 5%-10% of your fat intake should be saturated fat. Studies show that diets which are high in both monounsaturated, and saturated fats tend to maintain levels of testosterone much better than low-fat diets. 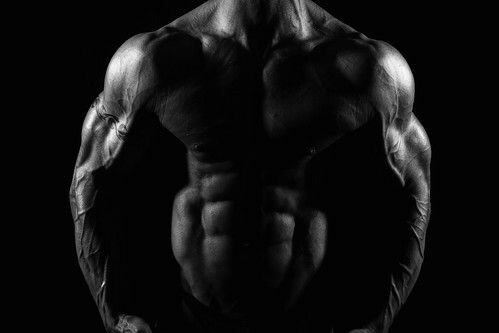 Keeping testosterone at optimal levels is very important to building muscle mass. Are the bodybuilders friend. Eating throughout the day helps you stay lean and build muscle as it provides all of the necessary calories and also keeps your metabolism stoked and burning fat. Try to consume meals that are close to the same size every 2-3 hours. Include quality protein and those good low GI carbs in each meal, and aim for between 6 and a maximum of 8 meals per day. Don’t forget a bedtime snack. When you’re sleeping, your body is fasting for 8 or however many hours you’re typically down each night. During this time amino acids are pulled from muscle fibers in order to fuel your brain. For a person who is working to increase muscle this is something to be avoided if possible – and that doesn’t mean you should get less sleep, it means that eating the proper foods right before bed is important. Again, the low GI carbs and healthy proteins are your best bets. These food choices will help to slow digestion and provide a steady supply of amino acids for fuel so your body won’t have to look to your muscle tissue to obtain them. Snacks such as cottage cheese or peanut butter are both ideal. 3-5 grams of Arginine in the morning before breakfast/30-60 minutes before working out/30-60 minutes before bed. 3-5 grams of Creatine with pre and post workout meals. 1-2 grams of Beta-Alanine with pre and post workout meals. 5-10 grams of branched-chain amino acids with breakfast, and with your last meal of the day. ZMA supplement that contains around 30mg of zinc, 450mg of magnesium, and 10mg of B6 one hour before bed. Even though this is quite a bit of information, it’s easy enough to implement, and once you’ve gotten used to following the tips on a daily basis, it all becomes part of your routine and no problem at all to maintain. Good luck! This is a guest post from Alan Jameson who contributes for Advance Me Merchant Cash Advances.